On 13 July, Lord Lieutenant Sir Henry presented Lucid Group with the Queen’s Award for Enterprise in International Trade. This award recognises UK-based businesses that have achieved outstanding growth overseas with substantial year-on-year growth. Lucid Group is a strategic medical communications company that recently celebrated its 10-year anniversary. The award confirms the success of its first decade of trading, which has seen its international trade grow exponentially over recent years. 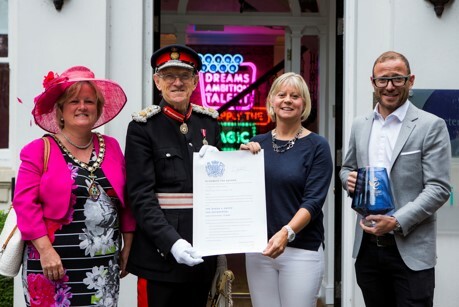 At the annual company summer meeting, Lucid co-founders Jan Steele and Dennis O’Brien were presented with the award by Buckinghamshire’s Lord Lieutenant Sir Henry. Chairman of Wycombe District Council Suzanne Brown was also in attendance. Lucid has previously won a number of industry-related prizes. In 2015, the agency received the title of Medical Education Consultancy of the Year at Communiqué for the third year in a row. With the Queen’s Award, its expertise and business success has been judged against a diverse array of companies from different types of industries for the first time.